Upon stepping into Maca Suazo’s studio, my attention was immediately drawn to her vibrant canvases of bright yellows, blues and greens. Besides the hanging paintings on the walls, Suazo’s studio is covered with book quotes, as her passion for reading has left her consistently channelling the relationship between painting and literature. Due to the fact that an artist’s culture has a great influence on their work, Suazo’s paintings are tied to her Chilean roots. Suazo was born in Vina del Mar, Chile. In 1997, Suazo attained a diploma in Physical Theatre from La Mancha International School of Gesture and Image in Santiago, Chile. She moved to British Columbia at the age of 25 to continue a career in acting. Although Suazo acted in theatrical performances for several years she found that it was a lonely art form and that her Spanish accent did not always work to her advantage. Yet, having painted all of her life, Suazo realized that when she painted she did not have an accent. She could say whatever she wanted to through her canvas and colourful oil palette. 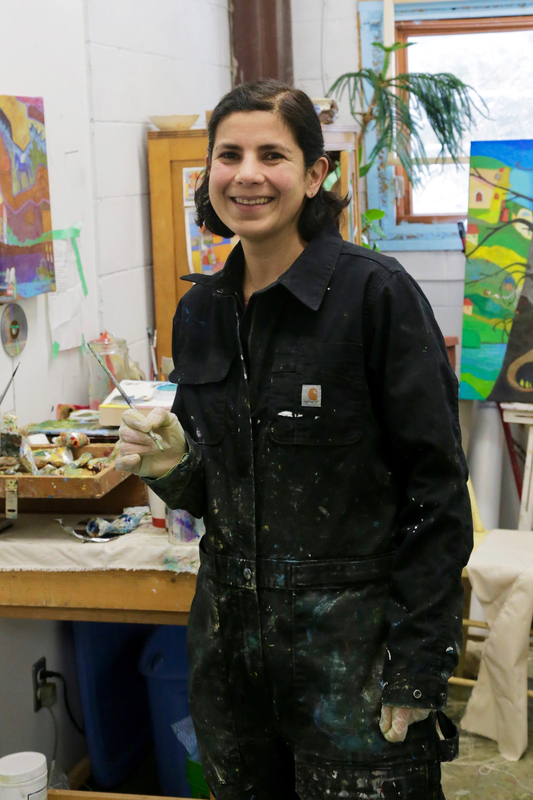 Suazo went on to take courses at Emily Carr in Victoria and graduated in 2010 from Fine Arts at the University of Waterloo, where she grew in painting techniques and developed her own style. In 2013, Suazo completed her Master of Arts in Latina American Literature at the University of Guelph. Today, Suazo currently resides and works as a painter in Waterloo, Ontario. Her paintings take viewers away on journeys to colourful lands where the sea is always on the horizon and hints of magic are present. Between 1973 to 1990, an authoritarian military regime ruled Chile in the form of a dictatorship. In order to control the greater population, the government restricted things such as books, to prevent people from consuming subversive content. Growing up during this time, Suazo only knew of the single library that existed in her province. It took Suazo and her mother an hour and a half bus ride to visit the library. Once there, one was not able to browse for books but could only purchase specific ones. Based on this experience in Chile, when Suazo moved to British Columbia she was amazed at the libraries that North America had to offer. Once Suazo starts painting in her studio experimentation is her motivating factor. On some paintings she has drawn onto them, on others, she has cut out book pages and pasted them onto the canvas. Suazo has also used music to gain inspiration. In one series of paintings, Suazo painted whilst listening to baroque music. “Music and painting meet at that point where words do not work or serve as tools of communication,” Suazo said. While it is no secret that artists are influenced by their own life, Suazo confirmed that her childhood memories have been the foundation of her paintings. The sight of boats and canoes within her paintings take her back to her childhood spent near the water and emphasizes the act of going on a journey. Suazo stated that her grandma is one of her biggest inspirations. Therefore, her grandmother reappears in various works, often times as an angel. With family being an important aspect of South American culture, Suazo chooses to paint positive reflections of life and sticks to themes of hope, endurance, and love. “Why would I focus on the tragic when there is enough tragedy in life?” Suazo said. For the past five years, Suazo has worked each summer on a local organic farm in Waterloo, which as given her another appreciation for colours and light. In a series called Farm Days, Suazo channelled the bright colours and textures that fill farming landscapes. Working outdoors has allowed Suazo to notice how the light changes throughout the day and how it affects the colours of the crops. “It makes the fruit and vegetables look so bright the tomatoes are like a rainbow of different reds,” Suazo said. Overall, working as a farmer continues to inspire Suazo’s paintings and allows her to reconnect with nature. Through her paintings, Suazo has created a world of entirely her own making. Between the beautiful landscapes of her native country, the magic rooted in her Chilean culture and the inspiration she gains from literature, Suazo allows fleeting moments to live forever on her canvases.